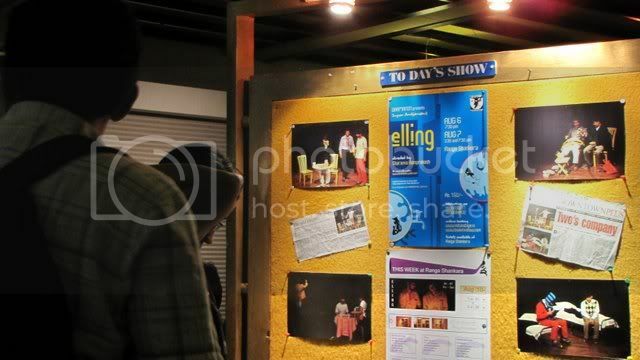 I’ve watched their last play, “Common Man”, but had missed the earlier shows of “Bhagwan Dhoondo”, and so decided that I’d go and see the fourth show, at ADA Ranga Mandira, on the 29th August, 2010. “Bhagwan Dhoondo” has a loosely structured first half, that introduces characters that are not fully clarified, except in the state of their existence in the city, and in the second half, the compere, Ranji David, takes responses from the audiences and picks one of these characters. Based on the inputs from the audience, the denouement is staged by the cast,.consisting of Abhijit Madhawaraj, Chetan Nataraj, Nandini Rao, Ramya M, Ranji David, Shalini Goel, Sumit Acharya, Sudarshan Ranganath, and Vishal Bhandary. One thing that struck me immediately was that the visual idiom of YTT has progressed a lot since I last witnessed one of their performances. They had always used colourful props like scarves and umbrellas, but in the present production, several props and red-motifed costumes were in evidence, and abstract concepts such as individuals joining the herd mentality of wanting “more” were expressed tellingly with the aid of one huge covering into which the actors disappeared. Cloth props were also used to great effect; a shroud-like covering was used to highlight characters, and make a statue in the park! I must congratulate Kuheli Mukherjee on her innovativeness with costume design. The light design by Ranji David, and the light execution by Deepak Trivedi, were both impressive. Situations and characters were highlighted, and the use of smoke on stage truly made a palpable stage aid of the light. 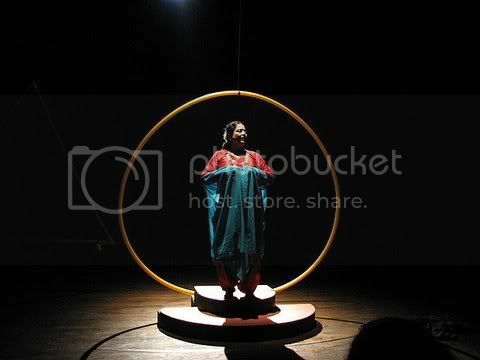 India Foundation for the Arts today presented “Antaryatra” (“The Journey Within the Self”), directed and performed by Usha Ganguli, at Ranga Shankara. Usha slipped in and out of the sutradhar’s part, and in and out of the characters of either the women in the plays, or the women in her life, effortlessly. Her mobile face expressed every emotion beautifully; that mobility allowed me to gloss over the couple of occasions when she fluffed her lines (and surely it must be a very difficult task to sustain a monologue for 75 minutes non-stop!). 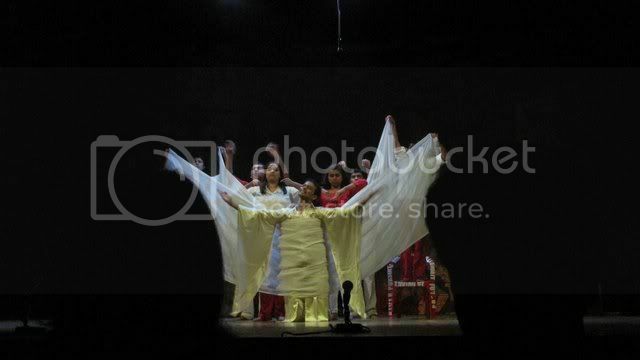 The dramatization opened with memories of Kolkata…and being a Kolkata-childhood person myself, I empathized perfectly. Her training in classical dance informed her movements on stage, and they were fluid and graceful, and it was a delight to watch her for this reason alone, if not for her emoting! 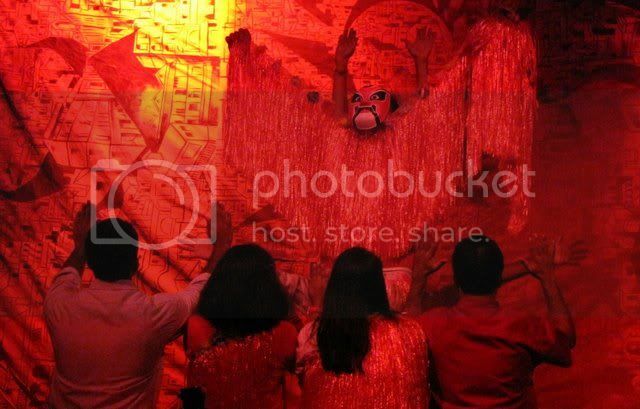 “Retell”, a series of narrative plays, was performed on June 5 and 6 at Ranga Shankara. 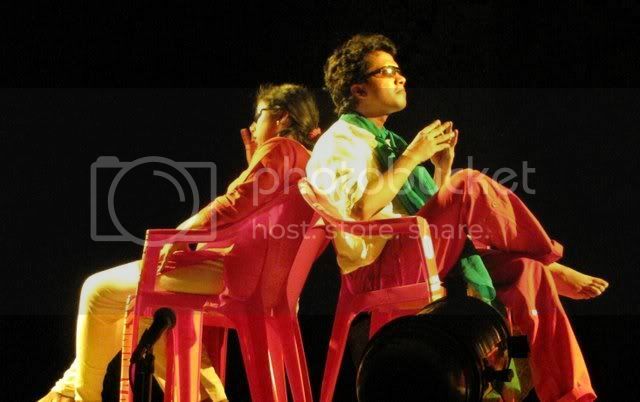 The production was by Theatre Nisha, a group from Chennai, and the design and direction was by V Balakrishnan. Some of the narratives were based on translations of the stories of Satyajit Ray, Gopa Majumdar, and others from the works of Goli Taragi, by Karim Emani and Sara Khalili. Having been interested in calligraphy, I decided to visit the Ethos Art Gallery that has come up in Jayanagar, and look at the work of Poosapati Parameshwar Raju, a calligraphic artist from Hyderabad. 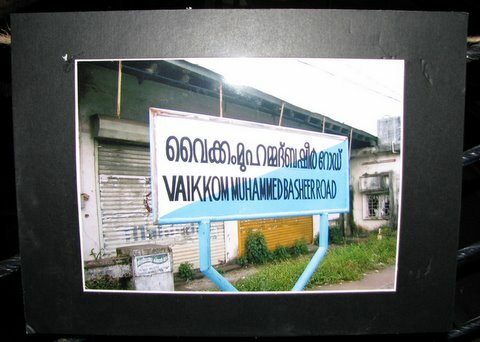 Calligraphy has a long association with Islam and is less often practiced in the Hindu idiom. But Parameshwar has done a fine job of it, demonstrating a skilled command over the use of his nibs and pens. There were several works on display, mostly done in red ink, and they have been chosen from eight series, starting from mythology, with thems such as Ganesh, Shiva, Narasimha, Om and so on. It’s always nice to be able to go and attend when a writer whose work you respect has his centenary celebrations! Perch, a theatre group based in Chennai, came to Ranga Shankara to celebrate a hundred years since the Malayalam writer, Vaikom Muhammad Basheer, was born. Perch has members from various backgrounds, and they are doing a great job of exploring the boundaries of theatre. 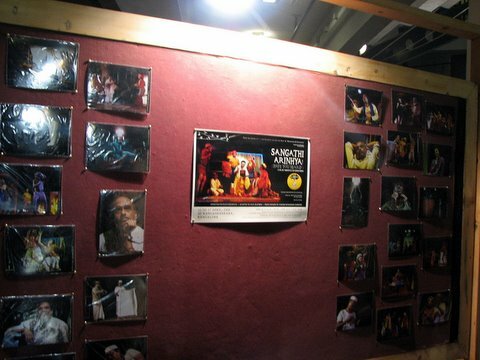 There were three parts to the celebrations at Ranga Shankara: the adaption of seven of Basheer’s stories into a play, “Sangathi Arinhya!” by Perch; the Moplah food festival at the Ranga Shankara cafe by Anju Sudarshan; and the collection of photographs (“Images from Kozhikode”) and sketches (by Vasudevan Namboodiri) of Basheer and his world. The review in two words? …the two words are…..excellent production. Now for some more words…. 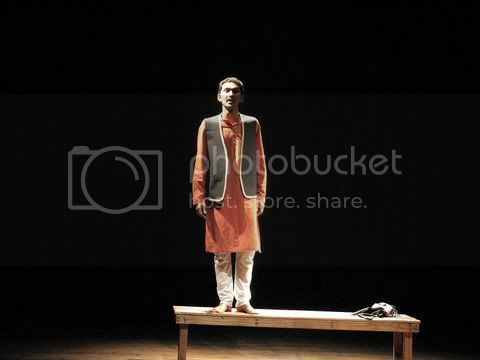 At Ranga Shankara, I was in the minority on two counts: one, I was probably the only one not to have seen this production earlier at Chowdiah Memorial Hall…and more importantly, I was, very probably, the only one not to have read the book, “Five Point Someone”, earlier. I had missed out on reading this book earlier (a slight aversion to “IIT lit”!) and took a considered decision not to read the book before seeing the play, and I think it was a good decision for me. The plot, the characters, the denouement, were all fresh and new to me. 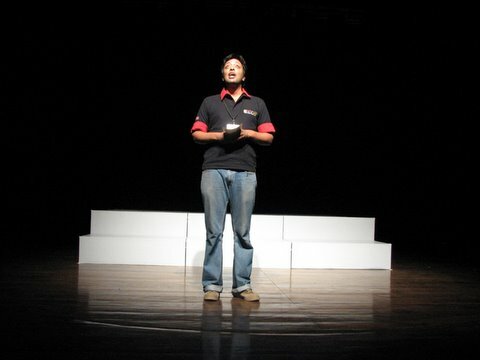 Whatever the genre of the play, Evam produces a well-wrapped package. Sunil Vishnu came up on stage and talked about the play, mentioning that Evam had been around for four years, 14 plays, and this was the 200th performance by them. He stressed that the 50th, 150th, and now the 200th performance were all at their favourite theatre space, Ranga Shankara. 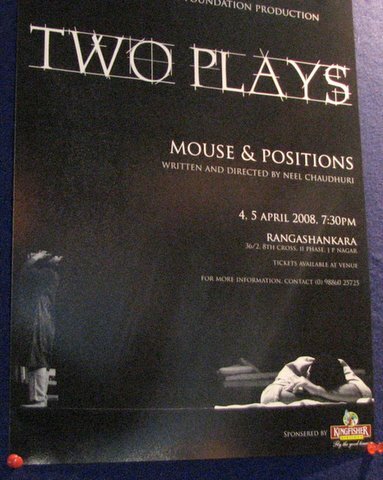 The First City Theatre Foundation, a Delhi-based group, is staging “Mouse” and “Positions #2” at Ranga Shankara today and tomorrow, the 5th of April, 2008, at 7.30pm. Today’s show made it immediately apparent that we had a director, playwright (Neel Chaudhuri) and cast which are a force to reckon with.